The Prime Minister made a Brexit statement this afternoon ahead of the amendable neutral motion being brought forward on Thursday. Here are the key points from the statement, Jeremy Corbyn’s response and the PM-MP Q&A session that followed. Jeremy Corbyn made a Failing Grayling joke. “I usually thank the Prime Minister for an advance copy of her statement,” the Labour leader started. “But it arrived just as I was leaving my office to come here… so I can only assume she entrusted it to the Transport Secretary to deliver.” Zing. MPs laughed, as did those watching from the press gallery – including Downing Street aides. But this one probably wasn’t intentional. “I wanted to have this sorted by Christmas,” said the Prime Minister who delayed the meaningful vote on her deal until after Christmas. The irony was, apparently, lost on her. But these are the same accusations levelled at the Labour leader by anti-Brexit opposition parties and internal critics, who argue that Corbyn’s refusal to back a ‘people’s vote’ is facilitating the goevrnment’s run-down-the-clock strategy. “To stand by and do nothing would be a complete dereliction of duty,” Corbyn said. That sounds a lot like the People’s Vote campaign talking about Labour’s current position on Brexit. The Labour leader went on to complain that the Prime Minister was “merely engaged in the pretence of working across parliament to find solutions”, adding: “She has not indicated she will move one iota away from her rejected deal or any of her red lines.” This only adds to the case of People’s Vote campaigners, who argue that Labour’s alternative has been rejected and the party must move on to backing a fresh EU referendum. “Just look at the record of the party opposite. They attacked trade union rights through the Trade Union Act, opposed the minimum wage, introduced employment tribunal fees and the public sector pay cap. For many of them, ripping up rights is what Brexit is all about,” Corbyn argued. Although the Labour leader is often accused of paving the way for his own MPs to rebel and vote for May’s deal, this line of argument undermines their central reason for doing so. In her recent letter to Corbyn, the PM’s emphasis on workers’ rights guarantees was understood to be aimed at potential Labour rebels (‘inbetweeners’ such as Lisa Nandy and Gareth Snell). This put a dent in that strategy. Another sign that any Tory-Labour agreement is far away, as both leaders continue to prioritise unity within their own party over unity across the House. The EU has made it clear that they will not reopen the withdrawal agreement itself, which is no longer up for renegotiation. But that didn’t stop May from telling Boris Johnson – who argued there was “no point” in a backstop time limit unless in the treaty itself – that she was seeking a legally-binding change on the backstop and the “obvious way to do that” is to change the agreement. May’s ‘my deal or no deal’ ultimatum is essential if there’s any chance of driving her deal through parliament, so she won’t be ruling it out for the moment – however many MPs and business ask her to do so. This held true today. This is important. May hinted that if there is insufficient to pass the withdrawal bill itself, because she might have delayed the next meaningful vote on her deal until a few days before exiting, it will be considered an “exception” and fast-tracked through parliament. This means overriding the 21-day requirement, known as CRAG (Constitutional Reform and Governance Act 2010). As Labour’s Luciana Berger highlighted in her question, it looks like MPs will be afforded little time to scrutinise Brexit legislation. It’s no surprise that it seems May plans to bring the meaningful vote on her deal back to the Commons just a few days before the exit date, relying on the threat of no deal and concessions on workers’ rights to get MPs on board. But her reliance on these two factors is risky, especially if today is anything to go by. 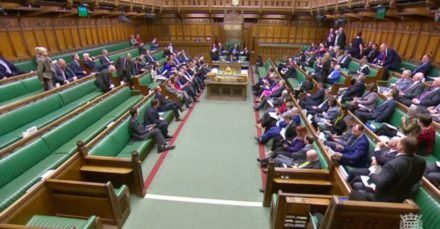 With Corbyn attacking the government’s record on workers’ rights and the Tory benches practically empty, showing little support for the Prime Minister from her own side, the ‘no deal’ ultimatum will be doing a lot of heavy lifting.